Services - Cook's Blacksmith Welding, Inc.
*Click title or photo to see more images in each department. Cook's traditional Blacksmith shop is a step back in time, creating items found in days gone by. Specializing in custom art and design as well as antique, heirloom repair. Our welding repair services cover a vast majority of customer needs, such as industrial, agricultural, commercial, residential and recreational, using the latest welding procedures and techniques. 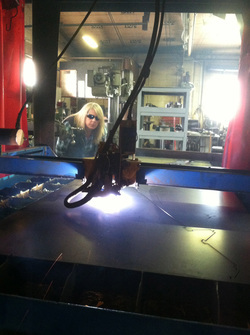 Cook's Welding Division can custom fabricate small items to vast construction from your design or ours. We use a variety of welding processes and can work with any type of metal. Our skilled fleet of mobile welding millwright units can meet your repair needs at any location within Michigan. Our mobile welding millwright units specialize in performing conveyor preventative maintenance inspections (PMI) , preventive maintenance (PM) and demand maintenance (DM) across the state of Michigan. Our Plasmacam computer driven plasma cutter can cut objects up to 4 feet in length and width. We can create files for cutting from a range of sources such as supplied graphics or even photos.